Collections development librarian Dan Coleman and I recently wrote a blog post about interesting Lawrence trees, but of course we all live amidst innumerable interesting and under-appreciated things. Hermit Hugh Cameron’s place. James Naismith’s grave. William Burroughs’ house. The diorama at KU’s Natural History Museum. Liberty Hall… A veritable atlas of the obscure could be compiled. Well, guess who’s coming to town? Dylan Thuras, co-editor of Atlas Obscuraopens a new window, will be speaking at Liberty Hall on September 21, as part of this year’s Kansas Preservation Conference. It’s free and open to all. Dylan: I’m Dylan Thuras, Co-Founder of Atlas Obscura. 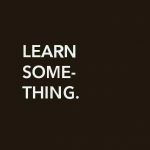 My Co-Founder Joshua Foer and I launched Atlas Obscura in 2009 as a “Guide to the World’s Hidden Wonders.” We started out primarily as a database of unusual and amazing locations, submitted by our users and vetted, curated, and edited by us. We have catalogued over 15,000 places, and focus on the kinds of places that get overlooked by traditional guidebooks. Outsider art locations, abandoned sites, infrastructure, cemeteries, historical locations, natural places—as long as it has a fascinating story, we are interested! We now have a large editorial team, run hundreds of events in cities all over the U.S., and take groups on trips all over the world. We have recently expanded to create Gastro Obscura, exploring the history and stories of unusual food and drink. Today I am Creative Director at AO. I do a lot on the print side of things: the new kids book, calendars, and the forthcoming Gastro Obscura, scheduled for a 2020 release. I also recently partnered with NPR’s All Things Considered on a road trip series up the West Coast. It aired in early August and hopefully there will be more coming along these lines. Dylan: Oh did I! My first love was a flour mill on the banks of the Mississippi River in Minneapolis, Minnesota, which everyone called Gold Medal Flour after the three-story red neon sign crowning the building. This gargantuan structure of towering grain silos and rusting metal skyways suspended in the air offered nine stories of adventure. At fifteen, I couldn’t get enough of it! 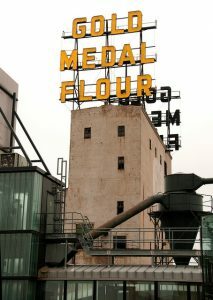 Gold Medal Flour building in Minneapolis. Image credit: Eric Kilby, via Flickr. I genuinely think that the interest in urban exploration is how a lot of people end up getting into their city’s history, and even end up invested in urban renewal, preservation, etc. Exploring these kinds of liminal spaces teaches you to see the city in new ways. Jake: Are there places you've yet to visit that you really want to go to? Dylan: I would love to visit the Root Bridges in India, grown together from the roots of living trees, and an incredible solution to the issue of seasonally flooding rivers destroying other kinds of bridges. I have been dying to visit for years! The combination of the ingenious engineering, beauty, local history, and the lushness of the surrounding jungle is irresistible. Dan: Kids seem more open to a sense of wonder about their surroundings than adults, but I worry that as they grow up, those doors of perception gradually close. Do you have any advice for parents who wish to keep their kids hungry to experience the weird and obscure in this world? Dylan: Let them explore, and go exploring with them! I think giving younger kids as long a leash as possible is very helpful. Every kid is different, and parents know their children best, but where possible, letting your kids do things that are slightly dangerous (within reason), giving them permission to explore, and helping them build their sense of confidence is crucial. I also think that parents being curious themselves and taking trips with your kids is a huge part of it. It doesn’t have to be anywhere exotic. My parents took me on these epic road trips through the Midwest and those trips instilled a real sense of the possibilities for discovery. Dan: What kinds of things did you read as a kid? Dylan: I read all sorts of things, and my parents are also to credit there. My favorites were the The Boxcar Childrenopens a new window books, Roald Dahl books like James and the Giant Peach, and as a little bit older kid, fantasy like Lord of the Rings. A lot of the books I loved most were about travel, exploration, or adventure—themes that draw in almost every kid. Dan: Many of the places in the new book are so amazing I can’t believe I’ve never heard of them before. How many are you able to visit yourself, and do you have a favorite? Dylan: I don’t have an exact “been there” count on Atlas Obscura— I am up to nearly 500 with probably another 100 I need to mark! A good chunk, many in the U.S., Eastern Europe, and South America. It’s always good to have more places on the list as it motivates your travel. My favorite place in the kids book (it’s in both books actually) is the Keshwa Chaca Rope Bridge, and it’s one which I have been to! Known as the last Incan Bridge, a huge suspension bridge woven entirely from grass, it’s one of my favorites. Truly spectacular looking and all the more so for the fact that it has been remade every year in the exact same way. The real treasure is not the bridge but the community that has kept up this tradition for over 500 years. Dan: I love the Astonishing Libraries section of the book, of course. What kinds of experiences with libraries have you had? Dylan: Libraries are among my favorite places in the world. The Austrian National Library and the Strahov Monastery Library in Prague are some of the most beautiful magical places I have been. Librarians, much like archivists and museum curators, may seem like mild mannered people, but they often hold the keys, both metaphorically and sometimes literally, to the most magical objects, stories, and locations you can find. -Jake Vail is an Information Services Assistant at Lawrence Public Library. "Buy 'em books and buy 'em books, and they still eat the covers." How do library books meet an untimely death? Dan counts the ways.